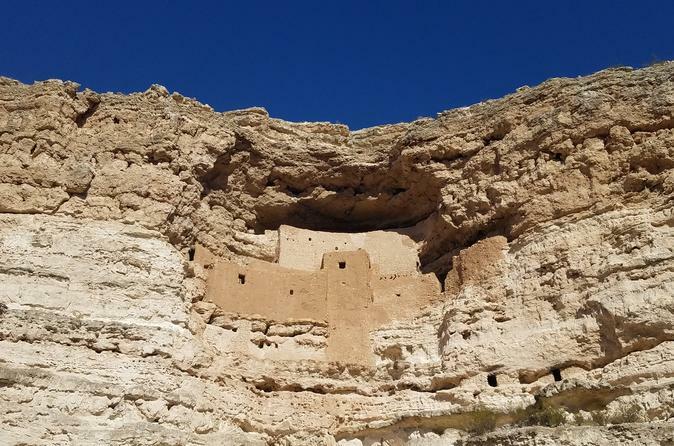 Explore the majestic Montezuma Castle and Tuzigoot Native American monuments and see the handiwork of the local Sinagua tribe. Get a chance to learn about the mining history and walk around the old mining town of Jerome, Arizona. Eat lunch in Uptown Sedona and later, walk around to check out local shops and artwork. See the local red rock viewpoints and sites, taking in their large colorful formations up close. Duration is 9-10 hours from Pickup to Drop-off. Lunch and all admission costs are included. Pickup will occur at 8 am at your hotel. From there we will take you to Montezuma Castle in a private SUV. A detailed narration of all historical sites and areas will be along the way. We will spend roughly 40 minutes touring and walking around the historical native monument. From here we will go to another prevalent Native American Monument (Tuzigoot). We will spend about 30 minutes walking around and touring this great wonder. From here we will go to the historical mining town of Jerome, AZ. Here you will have time to walk around and tour this great town in AZ for an hour. Soon after, we will head to Sedona and have lunch in the uptown area. After Lunch you will have time to walk around and explore the downtown area for about an hour. We will then hit some great red rock photo stops on the way out of town. We will then take you back to your hotel and get you back around 6pm. Pickup to drop-off is 9-10 hours. Lunch and all admission costs are included.